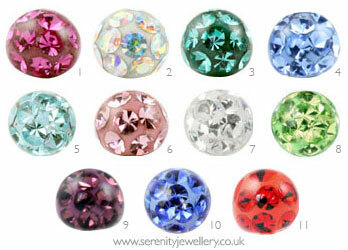 Hypoallergenic surgical steel 3.5mm and 4mm screw-on glitzy balls which have a smooth resin coating over multiple crystals. Please note: The threads in the glitzy balls are glued in and should therefore not be worn in swimming pools, baths, showers, saunas or in similar conditions as it may also cause them to fall out. Love this got it on my forward helix... so sparkly and cute! Took a while to screw on but I’ve managed to screw it on it’s so lovely! These are easy to put in and not too large or small. I think I might have been better with a different colour as I think the pink was too subtle on me! 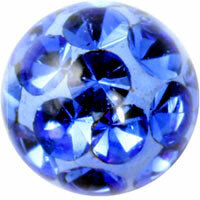 Really like the AB crystal 4 mm. Colourful sparkles! 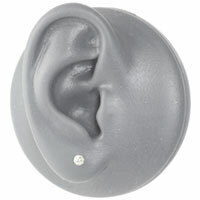 Love this as they are really sparkly and 3.5mm is perfect for my tragus piercing! However, im now on to my second one where the ball has came detached from the metal screw inside. I'm ever so sorry about that. Please send us an email and we'll put it right. Update: Having contacted the manufacturers we've added a warning about not getting the balls wet as it seems this can cause the threads to fall out. Iam now officially addicted to this site. Beautiful jewellery and great service.